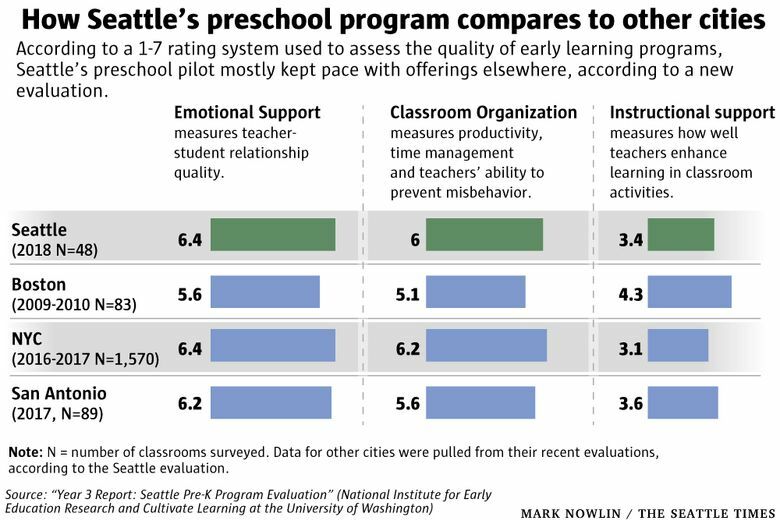 Seattle’s Preschool Program is in the final stretch of its four-year beta mode, and the results of its latest annual checkup are in — just months before voters determine its fate. After three years of operation, the quality of the city’s subsidized preschool program is on par with the most established Pre-K systems in the country, according to an external evaluation of the program released Monday. The report was paid for by the city, which is seeking to expand the program. Overall, it showed a positive trend in students’ literacy and language skills but a need for more improvement in math. The future of the Seattle Preschool Program — approved by Seattle voters as a $58 million pilot in 2014 — now rests with the city’s proposed $600 million-plus Families, Education, Preschool and Promise Levy, which would pay for its expansion over the next seven years. “What we see without this in place is the further calcification of inequity,” said Mayor Jenny Durkan. Framed in part as an early intervention for achievement gaps that can arise before students even get to kindergarten, the program, which serves roughly 1,200 3- and 4-year-olds, was created with the hopes that it would one day serve all children in the city. It launched in 2015 with 14 classrooms and 280 students. There are no income restrictions for 4-year-olds to enter the program, but 3-year-olds’ families must be making 300 percent of the federal poverty level (about $75,300 for a family of four) or below to qualify. When kids attend high-quality Pre-K programs, according to research cited by the U.S. Department of Education, they are less likely to repeat a grade, drop out or get referred for special-education services. They can also get an immediate edge in skills like math and reading. A 2014 analysis commissioned by the city found that around a third of Seattle’s preschool-age population, about 12,000 3- and 4-year-olds, were not enrolled in preschool. SPP complements other publicly funded Pre-K programs available to low-income families: the state’s Early Childhood Education and Assistance Program (ECEAP) and the federal Head Start program, which serve about 1,300 additional students. An expansion would increase enrollment to 2,500 students and create 50 more classrooms by end of the 2025-2026 school year, and cost over half the amount that the total levy would collect, $341.8 million. In 2019, the owner of a median-assessed value home would pay around $242 for the program, according to the city. The bulk of the money would be spent on tuition subsidies, the construction of new classrooms and coaching for teachers. About $1.9 million would be set aside to fund scholarships for existing program instructors to pursue degrees and certification in early- childhood education. The annual evaluations — conducted by researchers at the University of Washington and the New Jersey-based National Institute for Early Education Research (NIEER) — make up part of the total budget for the pilot and expanded programs. This year’s annual checkup, which cost the city $457,000, paints a largely positive picture. Based on tests administered at the beginning and end of the 2017-2018 year, the students’ gains in language and literacy surpassed those of a nationally representative sample of kids who took the same tests. Evaluators also rated the quality of instruction and classroom spaces higher than in previous years. “Even as the program has expanded, it has reached levels that in the research are associated with strong gains for kids,” said Steve Barnett, a co-author of the evaluation and director of the NIEER. The researchers flagged a few areas for improvement. While there were not “large” differences in academic gains by gender or race, according to the report, researchers did find that classroom quality was lower for black students compared to white students they evaluated in the study, though it did not appear to affect their performance, said Barnett.